The B & B is situated in the historical center of Piazza Armerina in a side street of Via Roma important. Its location makes this Bed and Breakfast ideal for pleasant and comfortable accommodation, a stone's throw from the historic Piazza Garibaldi, which leads to City Hall, the Church Fundr, the Town Hall, at St. Ignatius Church, at ' Former St. Anne Convent, the Municipal Library. All destinations within walking distance in 5 -10 minutes. From Piazza Armerina you can easy catch up the main artistic places and archaeological of the Sicily It orients them (Catania, Siracusa) and of the Western Sicily (Agrigento, Palermo). 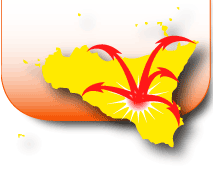 Situated in strategic position to the center of the Sicily.